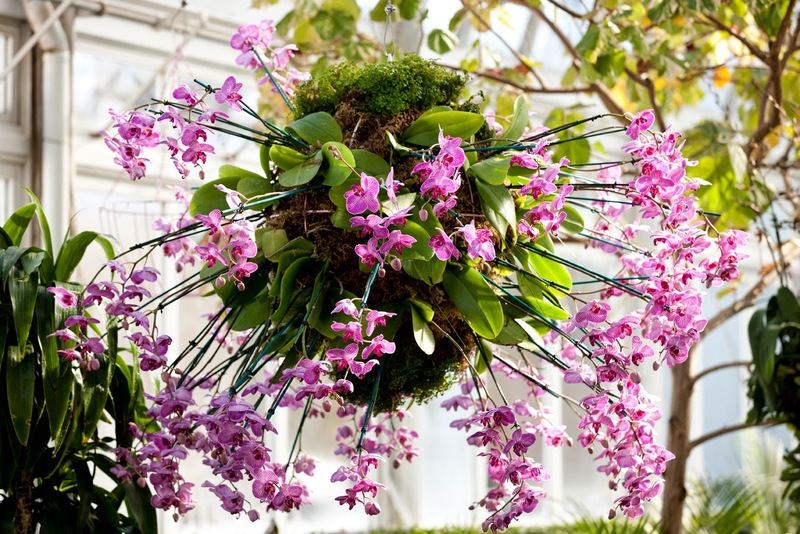 The New York Botanical Garden is flipping its orchid show upside down. 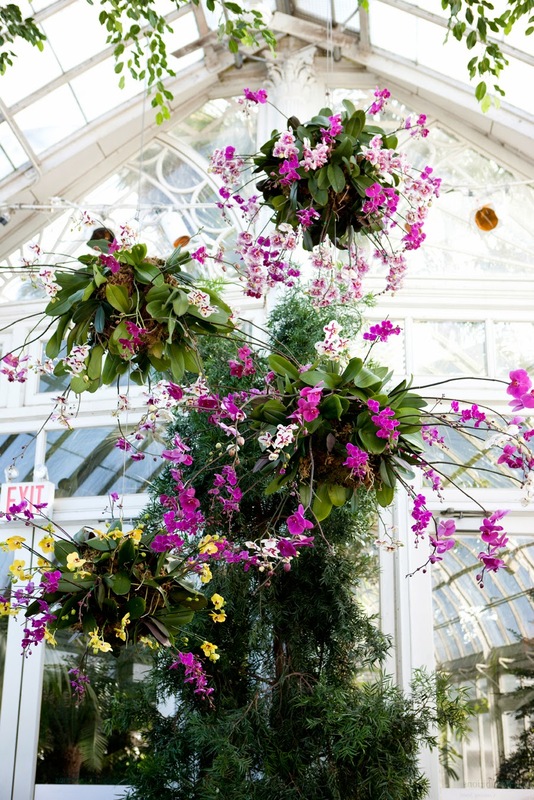 With 100 "chandeliers" bursting with a kaleidoscope of magenta purples, sweet cream yellows and hot pinks, this year's orchid blossoms not only steal the show on the ground but also in the air. "You will probably get a stiff neck from looking up high," said Karen Daubmann, associate vice president for exhibitions and public engagement for The New York Botanical Garden. "There's one really huge chandelier - the rest are plays on chandeliers - there's all sorts of things up in the air when we would typically just be planting the ground plane." For the first time in this 13th annual show, the design theme will run throughout the Enid A. Haupt Conservatory. "We would often times have orchids hanging in the trees in those other houses, but this year we are doing hanging chandeliers, hanging baskets and hanging orchids all the way through," she said. A giant star-shaped chandelier overflowing with hundreds of orchids is the centerpiece of this year's show. Pools of water mix with bright, natural light to reflect the cascading blossoms from above. Daubmann said the show offers a tropical weekend getaway in the Bronx. "This is the worst winter I can recall. I don't ever remember being in 5 degrees. I don't remember mountains of snow and ice," she said. "Our pathways are clear, our conservatory is hot. If you don't remember what it feels like to have humidity on your skin and in your hair, this is the place to be. It's beautiful and it's nice to just immerse yourself in such a summery and tropical environment." Orchids are the largest family of flowering plants, which includes more than 30,000 species. They range from miniatures with flowers less than 1/16 of an inch in diameter to giants more than 25 feet tall with flower spikes 10 feet long. They can be found on every continent except Antarctica. 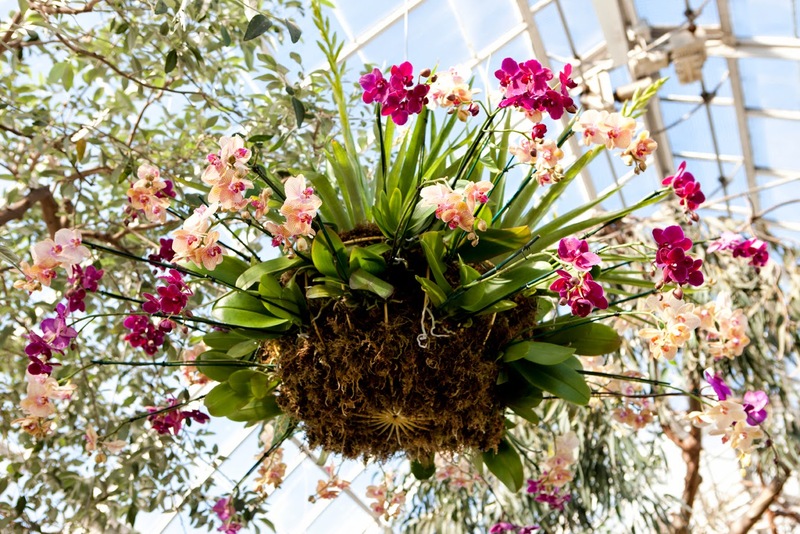 The New York Botanical Garden has 6,085 orchids in its permanent collection. "We have a really extensive orchid collection on site and we use many of those in the show, but we also buy in extra orchids to beef it up," said Daubmann. "I love the really fragrant orchids and really rare orchids, and I love when I can tell people the story behind them." Selected poems by award-winning poet Deborah Landau are also on display throughout the show. The poetry - inspired by orchids - will be on display throughout the landscape and accompanied by a free cell phone audio tour. People are really drawn to the poetry in the landscape, said Daubmann. "We work with great curators who do audio stops along with the poetry, so you can dial in and they tell you about the poem and why its sited in that particular spot and why they picked it," she said. "It's really nice to hear someone's thoughts about poetry, and what they think about it and why it works." Cell phone tours have evolved over the years at the garden, according to Daubmann. "This year we have quite a focus on 'how-to.' So, 'how to grow orchids,' 'how to repot orchids,' 'how to get orchids to reflower' - you can dial in and hear the information from the curators," she said. "So many people have questions about orchids. They are sort of a mysterious plant because people really want to grow them, and to know them, and to be successful with them, but sometimes they are the plant that people struggle with the most," she said. Daubmann said she hopes people will find success in growing orchids after attending this year's show. In addition, the garden has added evening hours for Orchid Evenings, which Daubmann calls romantic date nights. "A lot of people who work can't necessarily get to the garden between 10 in the morning and 6 at night. So we've added a lot of evening hours and people can come have a cocktail and enjoy live music and see the orchid show in a different way all lit up." To take home a part of the show, the Shop in the Garden will be offering many special orchids for sale, including hard-to-find specimens for connoisseurs and easy-to-grow varieties for beginners. Daubmann said there is a lot of expertise available in the shop to help make your orchid purchase successful. Cameras are welcome in the show. "People often bring cameras and take pictures and really enjoy being in a warm, humid environment," she said. "It's the perfect time of year to see orchids because they are so colorful, and often times very fragrant, and its a nice tropical environment." Tickets are available for purchase in advance or at the door. For a list of available programs, including musical performances, dance lessons and orchid demonstrations, click here. The show runs from February 28 through April 19, 2015. To view my photos from the show, click here.